Blue Ridge Energy line technicians along with contract crews are continuing power restoration efforts this evening as the remnants of Hurricane Florence cause sustained rain and wind gusts, leading to many downed trees outside of rights of way falling into power lines. Weather conditions will continue throughout tonight. As of 6:30 pm, restoration efforts are underway in: Ashe County, where 358 members are without power; Wilkes County, where 253 members are impacted; and Caldwell County, where 46 members are affected. Report outages by calling 1-800-448-2383 or on the Blue Ridge Energy mobile app. Outages can be viewed on the cooperative’s live outage map at www.BlueRidgeEnergy.com or on the mobile app. Check updates also on the cooperative’s social media channels on Facebook, Twitter and Instagram. Members are advised to stay far away from downed power lines as they can still be energized and therefore dangerous or even deadly. 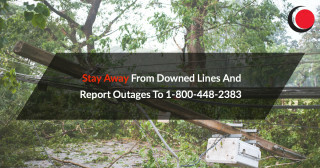 Report downed power lines to the cooperative at 1-800-451-5474. Caldwell County: 554 members affected from 17 damaged locations widespread across Lenoir, Hudson, the northwest part of the county including the Globe and Upton areas, and Buffalo Cove road. Watauga County: 2,349 members affected from 21 damaged locations widespread across the areas of Hound Ears, Calloway Mtn Rd, Zionsville, Blowing Rock and Deep Gap. Ashe County: 296 members affected from 27 damaged locations widespread across the areas of Beaver Creek, Warrensville, Creston, Shatley Springs and Obids. Alleghany County: 422 members affected from 16 damaged locations widespread across the areas of Glade Valley, Sparta, Chestnut Grove, and Hwy 18 South.